The Gale-Shapley “propose/reject” algorithm is a well-known procedure for solving the classical stable marriage problem. In this paper we study this algorithm in the context of the many-to-many stable marriage problem, also known as the stable allocation or ordinal transportation problem. We present an integral variant of the Gale-Shapley algorithm that provides a direct analog, in the context of “ordinal” assignment problems, of a well-known bicriteria approximation algorithm of Shmoys and Tardos for scheduling on unrelated parallel machines with costs. If we are assigning, say, jobs to machines, our algorithm finds an unsplit (non-preemptive) stable assignment where every job is assigned at least as well as it could be in any fractional stable assignment, and where each machine is congested by at most the processing time of the largest job. 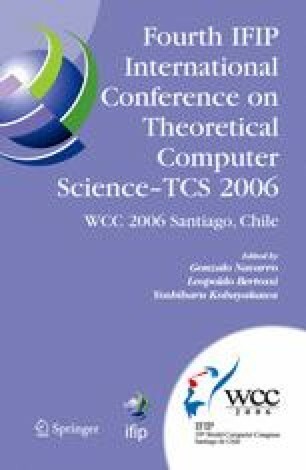 Please use the following format when citing this chapter: Dean, B.C., Goemans, M.X., Immorlica, N., 2006, in International Federation for Information Processing, Volume 209, Fourth IFIP International Conference on Theoretical Computer Science-TCS 2006, eds. Navarro, G., Bertossi, L., Kohayakwa, Y., (Boston: Springer), pp. 65–75.